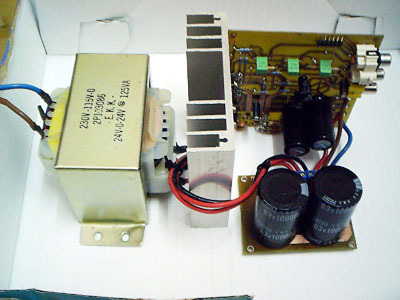 A 12 watt audio amplifier operating on a dual symmetrical supply of ± 12 volts. The 741 provides the required gain while the speaker drive is provided by the complementary Darlingtons T1, T2 and T3, T4. The input signals for the darlingtons are derived from the supply current of the 741. Since R6 is connected to the ground, the positive or negative signal currents also pass through R4 or R5. The voltage drop across these resistors serves as the input signal to the transistor pairs. An overall dc negative feedback from the common collector junction of T2 and T4 stabilises the dc conditions of the circuit and keeps the junction point at zero volts. Hence, no coupling capacitor is required for the speaker. Just discovered this blog thru Google, what a way to brighten up my day! Great post – I love your blog! Bhai (bro I need circuit for earphone amplifier using 741 or 3140 op-amp. i have made this circuit,the only problem i faced is to find transistors in pakistan other then that the cct workes if i apply vin 2v it amplifies up to 10.5 v with a lot of noise thats the only problem other wise i works great. Hi what is the maximum current drawn at the extreme points please? R3 and C1 acts as feed back circuit or for any other purpose???? what is d role of capacitors at output and in d feedback network??? wt z d role of both capacitors?? Bat i think TDA2003 its mor useful .. Thank you very much Ravindra . Wow it works well and good. Thanks guys. 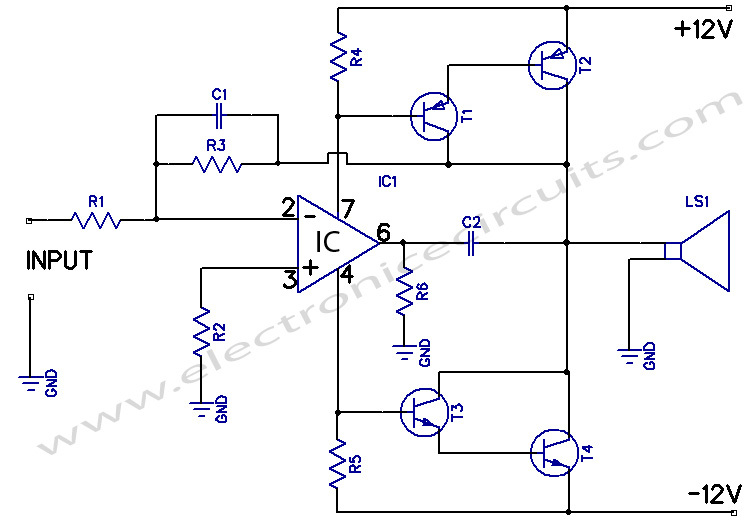 the circuit diagram is wrong. transistors t1,t2 and t3,t4 must be swapped. will it run on two 9 volt batteries ?